What makes Pirates of the Caribbean: Dead Men Tell No Tales so fantastic is the storyline echoes the past with a new generation, while touching on the heart of the original Pirates of the Caribbean: Curse of the Black Pearl characters. Nostalgically missing my Disney annual passes, my mind wanders back to one of my favorite rides singing Yo ho, yo ho, a pirate's life for me...but if you rode the ride as many times as I have, you would remember the first words you hear after setting sail. Dead Men Tell No Taaaaaaaaaales. It makes perfect sense that Disney would eventually use it as a title in one of their biggest grossing film series, Pirates of the Caribbean. Even more so, that the film itself would echo that nostalgic tone. 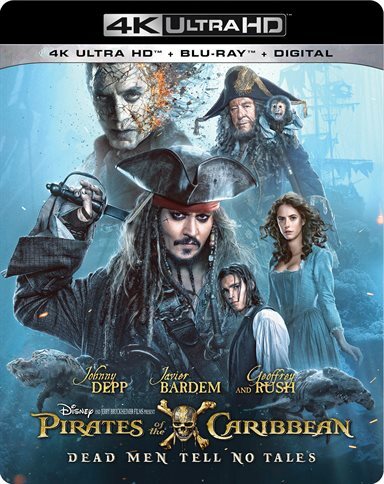 Pirates of the Caribbean: Dead Men Tell No Tales, one of the summer's big box office hits, will be released this week on DVD, Blu-ray and a beautiful 4k Ultra edition! If you were one of the few that didn't get to see this film in theaters over the summer, let me give you a little insight into "Dead Men Tell No Tales". The film starts off with young Henry jumping off a boat, with rocks tied to his leg, sinking to the bottom of the ocean, landing on the Flying Dutchman and telling his father Will Turner (Orlando Bloom; The Lord of the Rings Trilogy) that he will free Will from the curse that keeps him on the Dutchman with a treasure he read about….Poseidon's Trident. Nine years later Henry's Captain sails into the Devil's Triangle and is attacked by Captain Salazar (Oscar Award Winner Javier Bardem; No Country For Old Men) and his crew of the dead. Henry, who's in the brig at the moment, comes face to face with Captain Salazar, and the captain tells Henry he has nothing to worry about because he always leaves someone alive to tell the tale. He also asks Henry to give a message to Jack Sparrow (Johnny Depp: Edward Scissorhands)… "Death will come straight to him'. Of course, he would tell Sparrow himself, but alas dead men tell no tales (didn't see that coming did you?). Elsewhere, no man nor army has ever stolen the gold from St. Martin and yet while showing off the unbreakable safe, they open it to find Jack Sparrow, and he is not alone. Jack's crew then, while trying to hijack the safe, actually pulls the whole Bank from its foundation, dragging it through the streets of St Martin with Jack dragging behind. During the chase, Jack briefly meets Carina Smyth (Kaya Scodelario; The Maze Runner series) and helps her escape from her own troubles (accused of being a "witch" is never easy). The heist didn't go as planned and his crew turn their backs on Jack. Jack trades his trusty compass for a bottle of rum at one of the local taverns and that action unlocks Captain Salazar from his cursed prison. He is now on the hunt for Sparrow! Captain Hector Barbosa (Oscar Award winner Geoffrey Rush; Shine, The Kings Speech) makes a deal with a witch that gives him Jack's Compass and he then decides to make a deal with the dead Captain Salazar…. "I can find Jack if you let me live". Once again Jack Sparrow is captured and sentenced to die in the courtyard with young Carina as well, but Young Henry Turner (Brenton Thwaites; Maleficent, Gods of Egypt) steps in and, in a wild sequence, help the two escape death, with an assist from Jack's Crew. Once free, the three team up with hopes of finding the greatest treasure, Poseidon's Trident. What makes Pirates of the Caribbean: Dead Men Tell No Tales so fantastic is the storyline echoes the past with a new generation, while touching on the heart of the original Pirates of the Caribbean: Curse of the Black Pearl characters. The love triangle of Jack Sparrow, Will Turner and Elizabeth Swan (Keira Knightley; The Imitation Game) was the heart of the original 3 films and now it's the next generation taking over the mantel….while of course Johnny Depp steers the show. You simply can't have a Pirates of the Caribbean film without Captain Jack Sparrow!! Even the soundtrack, from the opening sequence with young Henry, echoes the love theme when we saw Turner kiss Swan in Pirates of the Caribbean: At World's End. While this is the first Pirates film without the great Hans Zimmer (Sherlock Holmes) at the helm…Geoff Zanelli (one of Zimmer's protégés) did wonders keeping the soundtrack alive and fresh while making it nostalgic as well. Personally, the previous installment, Pirates of the Caribbean: On Stranger Tides wasn't one of my favorites. It sailed off in a completely different direction and honestly, that may have been just what was needed, so that once we went back to these original characters, it would create that warm feeling in our hearts. As the saying goes, "you have to lose some things to give you the opportunity to miss them". I give mad props to the special effects department!! What they did with Captain Salazar and his crew, from the floating hair to the crewmembers missing limbs were just truly badass! The 2160p High Definition video quality of the 4K Blu-ray make these features stand out beautifully and simply give the whole film a sharpness and vibrancy that is outstanding. The Dolby Atmos audio is not to be rivaled and showcases the aforementioned soundtrack. There is also a well-done mix of dialogue, soundtrack and effect and nothing overpowers the other. I give "Pirates of the Caribbean: Dead Men Tell No Tales" 5 Gold doubloons of 5! If you're a Pirates fan, then this should be in your collection for sure! Oh and By The way….make sure you watch till the end of the credits. There's a bonus scene that may have just dictated Pirates 6!.....Drink up me 'earties, yo ho. Download Pirates of The Caribbean: Dead Men Tell No Tales from the iTunes Store in Digial HD. For more information about Pirates of The Caribbean: Dead Men Tell No Tales visit the FlickDirect Movie Database.